Copyright © 2015 Joe McDuffie and MarFran Press. Texas | USA. All Rights Reserved. Tranquil moments with joyful tears would be an appropriate description of my nostalgic periods at this point in my life! Such moments are filled with memories of a great childhood with wonderful loving family and many dear friends. These wonderful tranquil moments always take me to some thoughts about nourishing bounty associated with the times and/or events! For several years, with so many of the family having ended their earthly pilgrim journey, I have found myself enjoying more and more of those tranquil moments! Each moment conjures up an event of the period that still brings a smile to my face; joyful tears to my eyes; and reminders of how much I miss those loved ones. Whether it’s memories of my original fishing partners, (my Daddy and my two brother Brownie and Wally); or my cooking my first dish and my mother smiling saying how good it was, but never telling me – needs a little something; or my Aunt Emma T remind me that I’ll get a heavy cake if I don’t measure the flour properly; I usually find myself cooking a dish that solidifies those memories! As my young nieces miss their Grandma Bunch and Aunt Sister more and more; as they hear family stories about their Grandpa Joe that they never got a chance to meet; as they remember fun times with their Uncles Brownie and Wally and the cookies and brownies that they use to make for them, they find themselves more and more asking me for instructions and guidance on how Grandma made this; or do you have her recipe for that! Myriad requests became a catalyst for my tranquil moments, especially after writing down a recipe and passing it on to them. Before long, I began to notice my mental file of recipes became a voluminous physical file of written recipes! Over time, the file began to expand to include recipes that I had developed on my own and tested on friends during various phases of my adult life! This all became a labor of love and memories that culminated with organizing, tweaking, and finalizing the recipes into my first book! Of course, as a southerner, learning the value of a great ham bone; never wanting to waste it after many a meal from the muscles it supported, I concluded that “Ham Bones” would be the title of the book, with the tranquil moments dictating a subtitle to include the word “memoirs”! There were so many good cooks in my family; and more than sixty years of memories, making it impossible to get everything into one book! With constant urging on by family and many dear friends, my task was to “put pen to paper” for at least a first volume of a series with those memories and the food that I associated with them. 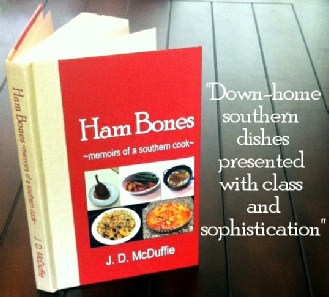 Thus, “Ham Bones: Memoirs of a Southern Cook” is volume one of the series. As I write this brief prose on how the book came about, I am tickled that I am about halfway through the second volume of “Ham Bones” with additional memories! However, right about now I need to take a quick break! I’m gettin’ hungry; ready to head to the kitchen – I wanna cook something!!! Mmmm – gotta taste for some biscuits and sausage gravy!!! Y’all come on in here and sit down! Enjoy some of this good food I grew up eatin’!!! 100 Mouth-Watering Home-Cookin’ Recipes You’ll Never Forget! J.D. McDuffie learned his cooking skills from two ladies that were sensational southern cooks: His mother and her older sister, a home economist! Order your copy of Ham Bones here!